The "five rolls" ( )—Song of Solomon, Ruth, Lamentations, Ecclesiastes, and Esther. 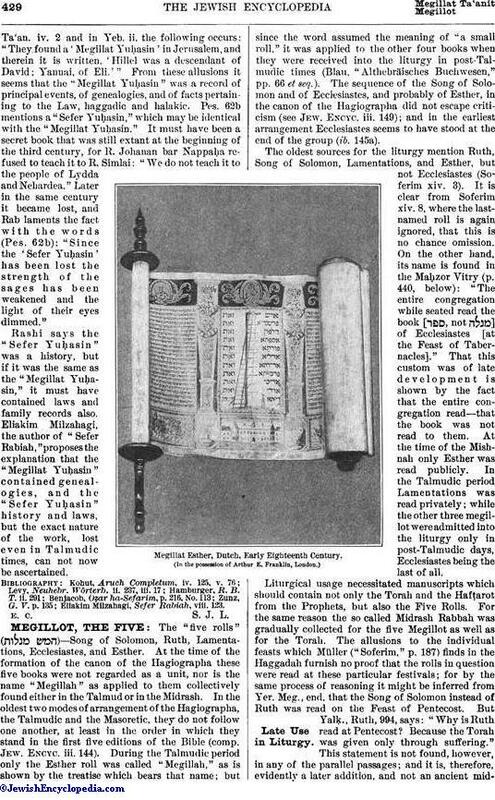 At the time of the formation of the canon of the Hagiographa these five books were not regarded as a unit, nor is the name "Megillah" as applied to them collectively found either in the Talmud or in the Midrash. In the oldest two modes of arrangement of the Hagiographa, the Talmudic and the Masoretic, they do not follow one another, at least in the order in which they stand in the first five editions of the Bible (comp. Jew. Encyc. iii. 144). 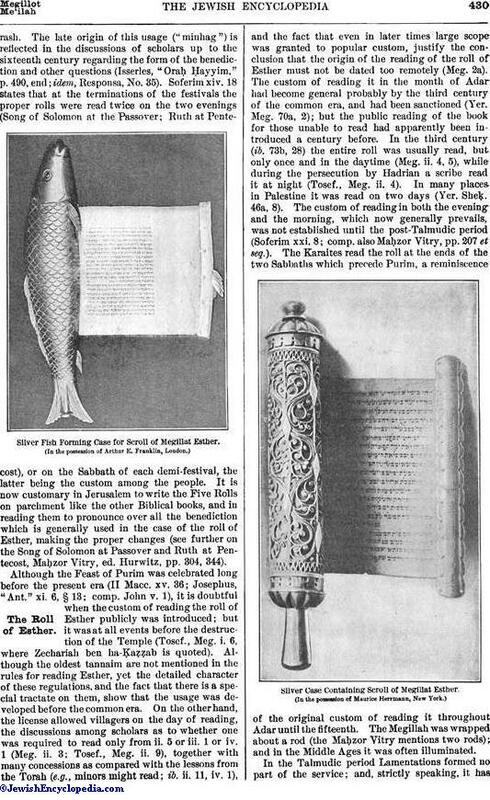 During the Talmudic period only the Esther roll was called "Megillah," as is shown by the treatise which bears that name; but since the word assumed the meaning of "a small roll," it was applied to the other four books when they were received into the liturgy in post-Talmudic times (Blau, "Althebräisches Buchwesen," pp. 66 et seq.). The sequence of the Song of Solomon and of Ecclesiastes, and probably of Esther, in the canon of the Hagiographa did not escape criticism (see Jew. Encyc. iii. 149); and in the earliest arrangement Ecclesiastes seems to have stood at the end of the group (ib. 145a). The oldest sources for the liturgy mention Ruth, Song of Solomon, Lamentations, and Esther, but not Ecclesiastes (Soferim xiv. 3). It is clear from Soferim xiv. 8, where the last-named roll is again ignored, that this is no chance omission. On the other hand, its name is found in the Maḥzor Vitry (p. 440, below): "The entire congregation while seated read the book [ , not ] of Ecclesiastes [at the Feast of Tabernacles]." That this custom was of late development is shown by the fact that the entire congregation read—that the book was not read to them. At the time of the Mishnah only Esther was read publicly. In the Talmudic period Lamentations was read privately; while the other three megillot were admitted into the liturgy only in post-Talmudic days, Ecclesiastes being the last of all. Megillat Esther, Dutch, Early Eighteenth Century. (In the possession of Arthur E. Franklin, London. )Late Use in Liturgy. Liturgical usage necessitated manuscripts which should contain not only the Torah and the Hafṭarot from the Prophets, but also the Five Rolls. For the same reason the so-called Midrash Rabbah was gradually collected for the five Megillot as well as for the Torah. The allusions to the individual feasts which Müller ("Soferim," p. 187) finds in the Haggadah furnish no proof that the rolls in question were read at these particular festivals; for by the same process of reasoning it might be inferred from Yer. Meg., end, that the Song of Solomon instead of Ruth was read on the Feast of Pentecost. But Yalḳ., Ruth, 994, says: "Why is Ruth read at Pentecost? Because the Torah was given only through suffering." 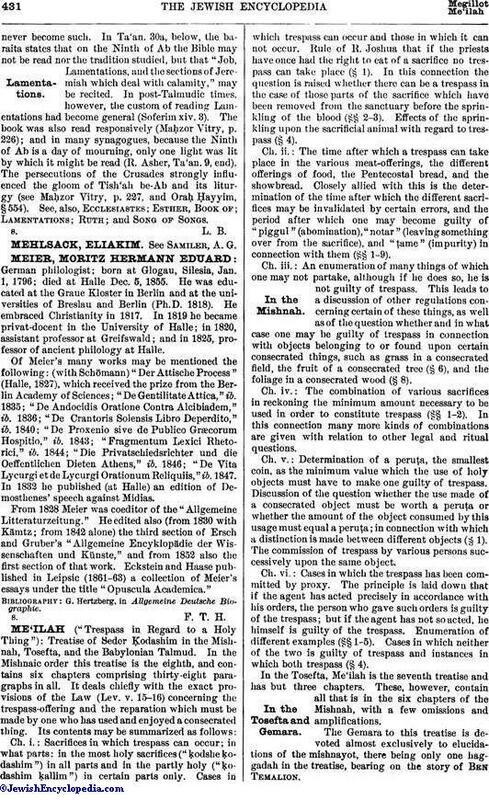 This statement is not found, however, in any of the parallel passages; and it is, therefore, evidently a later addition, and not an ancient midrash.The late origin of this usage ("minhag") is reflected in the discussions of scholars up to the sixteenth century regarding the form of the benediction and other questions (Isserles, "Oraḥ Ḥayyim," p. 490, end; idem, Responsa, No. 35). Soferim xiv. 18 states that at the terminations of the festivals the proper rolls were read twice on the two evenings (Song of Solomon at the Passover; Ruth at Pentecost), or on the Sabbath of each demi-festival, the latter being the custom among the people. It is now customary in Jerusalem to write the Five Rolls on parchment like the other Biblical books, and in reading them to pronounce over all the benediction which is generally used in the case of the roll of Esther, making the proper changes (see further on the Song of Solomon at Passover and Ruth at Pentecost, Maḥzor Vitry, ed. Hurwitz, pp. 304, 344). 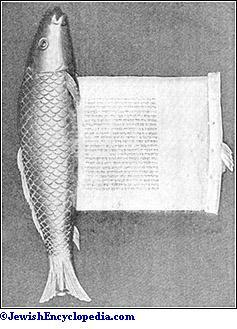 Silver Fish Forming Case for Scroll of Megillat Esther. (In the possession of Arthur E. Franklin, London. )The Roll of Esther. Although the Feast of Purim was celebrated long before the present era (II Macc. xv. 36; Josephus, "Ant." xi. 6, § 13; comp. John v. 1), it is doubtful when the custom of reading the roll of Esther publicly was introduced; but it was at all events before the destruction of the Temple (Tosef., Meg. i. 6, where Zechariah ben ha-Ḳaẓẓab is quoted). Although the oldest tannaim are not mentioned in the rules for reading Esther, yet the detailed character of these regulations, and the fact that there is a special tractate on them, show that the usage was developed before the common era. On the other hand, the license allowed villagers on the day of reading, the discussions among scholars as to whether one was required to read only from ii. 5 or iii. 1 or iv. 1 (Meg. ii. 3; Tosef., Meg. ii. 9), together with many concessions as compared with the lessons from the Torah (e.g., minors might read; ib. ii. 11, iv. 1), and the fact that even in later times large scope was granted to popular custom, justify the conclusion that the origin of the reading of the roll of Esther must not be dated too remotely (Meg. 2a). The custom of reading it in the month of Adar had become general probably by the third century of the common era, and had been sanctioned (Yer. Meg. 70a, 2); but the public reading of the book for those unable to read had apparently been introduced a century before. In the third century (ib. 73b, 28) the entire roll was usually read, but only once and in the daytime (Meg. ii. 4, 5), while during the persecution by Hadrian a scribe read it at night (Tosef., Meg. ii. 4). In many places in Palestine it was read on two days (Yer. Sheḳ. 46a, 8). The custom of reading in both the evening and the morning, which now generally prevails, was not established until the post-Talmudic period (Soferim xxi. 8; comp. also Maḥzor Vitry, pp. 207 et seq.). The Karaites read the roll at the ends of the two Sabbaths which precede Purim, a reminiscence of the original custom of reading it throughout Adar until the fifteenth. 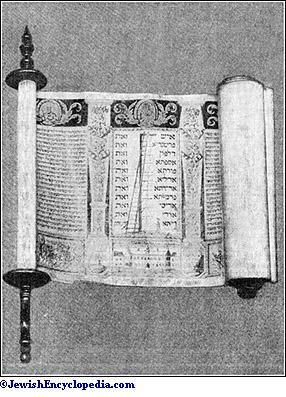 The Megillah was wrapped about a rod (the Maḥzor Vitry mentions two rods); and in the Middle Ages it was often illuminated. 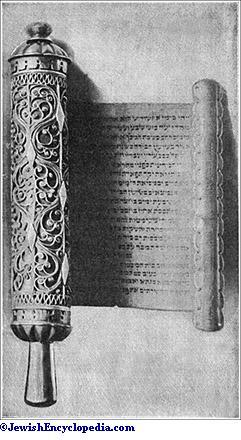 Silver Case Containing Scroll of Megillat Esther. (In the possession of Maurice Herrmann, New York.)Lamentations. In the Talmudic period Lamentations formed no part of the service; and, strictly speaking, it hasnever become such. In Ta'an. 30a, below, the baraita states that on the Ninth of Ab the Bible may not be read nor the tradition studied, but that "Job, Lamentations, and the sections of Jeremiah which deal with calamity," may be recited. In post-Talmudic times, however, the custom of reading Lamentations had become general (Soferim xiv. 3). The book was also read responsively (Maḥzor Vitry, p. 226); and in many synagogues, because the Ninth of Ab is a day of mourning, only one light was lit by which it might be read (R. Asher, Ta'an. 9, end). The persecutions of the Crusades strongly influenced the gloom of Tish'ah be-Ab and its liturgy (see Maḥzor Vitry, p. 227, and Oraḥ Ḥayyim, § 554). See, also, Ecclesiastes; Esther, Book of; Lamentations; Ruth; and Song of Songs.